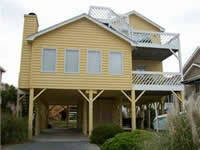 If you want to vacation in a laidback, relaxed, welcoming community check out our Sunset Beach NC beach houses. Sunset Beach boasts a breathtaking shoreline and is attractive in both its landscape and its relaxed atmosphere. Established in 1968, Sunset Beach is the southernmost of the North Carolina barrier islands and is 3 miles of the most beautiful beachfront in the state. It’s an ideal location for those who enjoy pier fishing, surf fishing, swimming, surfing, and playing in the sand — all the things associated with the beach. The mainland portion of the town offers shopping centers, grocery stores, small boutiques, dining, golf and the Ingram Planetarium. While you’re here don’t miss the Turtle Watching ongoing event. The Sunset Beach Turtle Watch Program (SSBTWP) is a private, nonprofit program that solicits volunteers to help monitor turtle nesting at Sunset Beach, North Carolina. May through October offers nesting and hatching sea turtles along our Islands. Experience the wonder of a nesting loggerhead turtle or the “boil” of a hatching nest! What an experience! During nesting lays, you may have an opportunity to name the next for a small donation to the turtle watch program. “Nest parents” (volunteers) watch nests nightly during their expected hatching times to assist the babies into the surf and to protect them from predators. Located halfway between Myrtle Beach, SC and Wilmington, NC, the nearby area offers a diversity of cultural activities including many waterfront dining venues, theatre, museums, and golf courses galore offering both casual golf and competitive tournaments. An experience unique to Sunset Beach is the walk through Mad Inlet to Bird Island. Bird Island is a 1,300-acre North Carolina Coastal Reserve completely untouched by development. Our beach houses are so enchanting that we’re sure you’ll want to make them your home.